Understanding Media: The Extensions of Man is a 1964 book by Marshall McLuhan, in which the author proposes that the media, not the content that they carry, should be the focus of study. He suggests that the medium affects the society in which it plays a role mainly by the characteristics of the medium rather than the content. The book is considered a pioneering study in media theory. McLuhan pointed to the light bulb as an example. A light bulb does not have content in the way that a newspaper has articles or a television has programs, yet it is a medium that has a social effect; that is, a light bulb enables people to create spaces during nighttime that would otherwise be enveloped by darkness. He describes the light bulb as a medium without any content. McLuhan states that "a light bulb creates an environment by its mere presence." The book is the source of the well-known phrase "The medium is the message". It was a leading indicator of the upheaval of local cultures by increasingly globalized values. The book greatly influenced academics, writers, and social theorists. In Part One, McLuhan discusses the differences between hot and cool media and the ways that one medium translates the content of another medium. Briefly, "the content of a medium is always another medium." In Part Two, McLuhan analyzes each medium (circa 1964) in a manner that exposes the form, rather than the content of each medium. In order, McLuhan covers The Spoken Word, The Written Word (as in a manuscript or incunabulum), Roads and Paper Routes, Numbers, Clothing, Housing, Money, Clocks, The Print (as in pictorial lithograph or woodcut), Comics, The Printed Word (as in Typography), Wheel, Bicycle and Airplane, The Photograph, The Press, Motorcar, Ads, Games, Telegraph, The Typewriter, The Telephone, The Phonograph, Movies, Radio, Television, Weapons, and Automation. 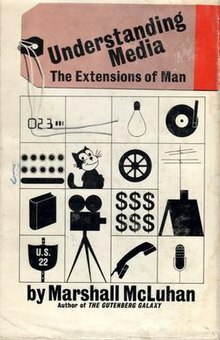 Throughout Understanding Media: The Extensions of Man, McLuhan uses historical quotes and anecdotes to probe the ways in which new forms of media change the perceptions of societies, with specific focus on the effects of each medium as opposed to the content that is transmitted by each medium. McLuhan identified two types of media: "hot" media and "cool" media. This terminology does not refer to the temperature or emotional intensity, nor some kind of classification, but to the degree of participation. Cool media are those that require high participation from users, due to their low definition (the receiver/user must fill in missing information). Since many senses may be used, they foster involvement. Conversely, hot media are low in audience participation due to their high resolution or definition. Film, for example, is defined as a hot medium, since in the context of a dark movie theater, the viewer is completely captivated, and one primary sense—visual—is filled in high definition. In contrast, television is a cool medium, since many other things may be going on and the viewer has to integrate all of the sounds and sights in the context. McLuhan uses interchangeably the words medium, media and technology. For McLuhan a medium is "any extension of ourselves", or more broadly, "any new technology". In addition to forms such as newspapers, television and radio, McLuhan includes the light bulb, cars, speech and language in his definition of "media": all of these, as technologies, mediate our communication; their forms or structures affect how we perceive and understand the world around us. McLuhan says that conventional pronouncements fail in studying media because they focus on content, which blinds them to the psychic and social effects that define the medium's true significance. McLuhan observes that any medium "amplifies or accelerates existing processes", introduces a "change of scale or pace or shape or pattern into human association, affairs, and action", resulting in "psychic, and social consequences"; this is the real "meaning or message" brought by a medium, a social and psychic message, and it depends solely on the medium itself, regardless of the 'content' emitted by it. This is basically the meaning of "the medium is the message". To demonstrate the flaws of the common belief that the message resides in how the medium is used (the content), McLuhan uses the example of mechanization, pointing out that regardless of the product (e.g.. cornflakes or Cadillacs), the impact on workers and society is the same. In a further exemplification of the common unawareness of the real meaning of media, McLuhan says that people "describe the scratch but not the itch." As an example of "media experts" who follow this fundamentally flawed approach, McLuhan quotes a statement from "General" David Sarnoff (head of RCA), calling it the "voice of the current somnambulism." Each medium "adds itself on to what we already are", realizing "amputations and extensions" to our senses and bodies, shaping them in a new technical form. As appealing as this remaking of ourselves may seem, it really puts us in a "narcissistic hypnosis" that prevents us from seeing the real nature of the media. The impact of each medium is somewhat limited to the previous social condition, since it just adds itself to the existing, amplifying existing processes. Therefore, different societies may be differently transformed by the same media. An overlooked, constantly repeated understanding McLuhan has is that moral judgement (for better or worse) of an individual using media is very difficult, because of the psychic effects media have on society and their users. Moreover, media and technology, for McLuhan, are not necessarily inherently "good" or "bad" but bring about great change in a society's way of life. Awareness of the changes are what McLuhan seemed to consider most important, so that, in his estimation, the only sure disaster would be a society not perceiving a technology's effects on their world, especially the chasms and tensions between generations. The only possible way to discern the real "principles and lines of force" of a media (or structure) is to stand aside from it and be detached from it. This is necessary to avoid the powerful ability of any medium to put the unwary into a "subliminal state of Narcissus trance," imposing "its own assumptions, bias, and values" on him. Instead, while in a detached position, one can predict and control the effects of the medium. This is difficult because "the spell can occur immediately upon contact, as in the first bars of a melody." One historical example of such detachment is Alexis de Tocqueville and the medium of typography. He was in such position because he was highly literate. Instead, an historical example of the embrace of technological assumptions happened with the Western world, which, heavily influenced by literacy, took its principles of "uniform and continuous and sequential" for the actual meaning of "rational." McLuhan argues that media are languages, with their own structures and systems of grammar, and that they can be studied as such. He believed that media have effects in that they continually shape and re-shape the ways in which individuals, societies, and cultures perceive and understand the world. In his view, the purpose of media studies is to make visible what is invisible: the effects of media technologies themselves, rather than simply the messages they convey. Media studies therefore, ideally, seeks to identify patterns within a medium and in its interactions with other media. Based on his studies in New Criticism, McLuhan argued that technologies are to words as the surrounding culture is to a poem: the former derive their meaning from the context formed by the latter. Like Harold Innis, McLuhan looked to the broader culture and society within which a medium conveys its messages to identify patterns of the medium's effects. In the first part of Understanding Media, McLuhan also states that different media invite different degrees of participation on the part of a person who chooses to consume a medium. Some media, such as film, were "hot" - that is, they enhance one single sense, in this case vision, in such a manner that a person does not need to exert much effort in filling in the details of a movie image. McLuhan contrasted this with "cool" TV, which he claimed requires more effort on the part of viewer to determine meaning, and comics, which due to their minimal presentation of visual detail require a high degree of effort to fill in details that the cartoonist may have intended to portray. A movie is thus said by McLuhan to be "hot", intensifying one single sense "high definition", demanding a viewer's attention, and a comic book to be "cool" and "low definition", requiring much more conscious participation by the reader to extract value. This concept appears to force media into binary categories. However, McLuhan's "hot" and "cool" exist on a continuum: they are more correctly measured on a scale than as dichotomous terms. The movie speeds up the mechanical (a sequence of frames) with the "sheer speeding up the mechanical, it carried us from the world of sequence and connections into the world of creative configuration and structure. The message of the movie medium is that of transition from lineal connections to configurations." the electric age The instant speed of electricity brought simultaneity. It ended the sequencing/concatenation introduced by mechanization, and so "the causes of things began to emerge to awareness again". "The electric speed further takes over from mechanical movie sequences, then the lines of force in structures and in media become loud and clear. We return to the inclusive form of the icon." It imposed the shift from the approach of focusing on "specialized segments of attention" (adopting one particular perspective), to the idea of "instant sensory awareness of the whole", an attention to the "total field", a "sense of the whole pattern". It made evident and prevalent the sense of "form and function as a unity", an "integral idea of structure and configuration". This had major impact in the disciplines of painting (with cubism), physics, poetry, communication and educational theory. the new visual print culture The message are the principles of uniformity, continuity, and linearity. McLuhan calls the message of this two, "their grammar". Impact on human associations: the printed word, through "cultural saturation" in the 18th century, "homogenized the French nation, overlaying the complexities of ancient feudal and oral society"; this opened the way for the Revolution, which "was carried out by the new literati and lawyers." Limits on impact: it could not "take complete hold" on a society such as Great Britain, in which the preceding "ancient oral traditions of common law", that made the country culture so discontinuous and unpredictable and dynamic, was very powerful and "backed by the medieval legal institution of Parliament"; print culture, led instead to major revolutions in France and North America, because they were more linear and lacked contrasting institutions of comparable power. the content of print is the written word. "It is an actual process of thought, which is in itself nonverbal"
"It speaks, and yet says nothing." "it accelerated and enlarged the scale of previous human functions, creating totally new kinds of cities and new kinds of work and leisure." freight; "functioning in a tropical or a northern environment"
Dwight Macdonald, in turn, reproached McLuhan for his focus on television and for his "aphoristic" style of prose, which he believes left Understanding Media filled with "contradictions, non-sequiturs, facts that are distorted and facts that are not facts, exaggerations, and chronic rhetorical vagueness." McLuhan's theories about "The medium is the message", link culture and society. A recurrent topic is the contrast between oral cultures and print culture. Each new form of media, according to the analysis of McLuhan, shapes messages differently thereby requiring new filters to be engaged in the experience of viewing and listening to those messages. McLuhan argues that as "sequence yields to the simultaneous, one is in the world of the structure and of configuration". The main example is the passage from mechanization (processes fragmented into sequences, lineal connections) to electric speed (faster up to simultaneity, creative configuration, structure, total field). Howard Rheingold comments upon McLuhan's "the medium is the message" in relation to the convergence of technology, specifically the computer. In his book Tools for Thought Rheingold explains the notion of the universal machine - the original conception of the computer. Eventually computers will no longer use information but knowledge to operate, in effect thinking. If in the future computers (the medium) are everywhere, then what becomes of McLuhan's message? According to McLuhan, the French revolution and American revolution happened under the push of print whereas the preexistence of a strong oral culture in Britain prevented such an effect. Official website of the author.